Highland Mills, NY - Yet another community is trying to figure out how to regulate an eruv within its borders, with the Orange County Town of Woodbury holding a hearing tomorrow night to discuss a pending eruv law. Mayor Michael Queenan said that he has met with the town’s Chasidic residents hoping that accommodations can be made to satisfy everyone who lives in Woodbury. Under the proposed law, an eruv would be required to be between eight and 20 feet high and would have to be either translucent or color-matched to any supporting structure. Eruvim would not be permitted to cross any public roadway and written consent would be required for an eruv to go over private property. Homeowners would be taxed for the value of any eruv on their property and if the proposed legislation is enacted, any eruv found to be in violation would have to be removed within 90 days. Legislating eruvim is perfectly in keeping with existing Woodbury laws, insisted Queenan, who noted that homeowners are required to obtain permits before constructing any decks, sheds or fences on their property. Town law also prohibits residents from mounting cameras on utility poles and a recently enacted moratorium bans small 5G cell phone towers from being placed on telephone poles until a determination can be made how to deal with these new devices. 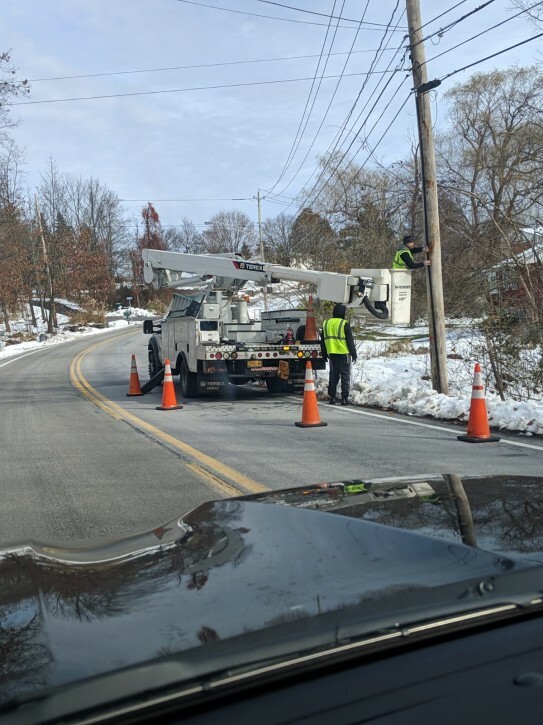 While the Woodbury eruv committee has secured permission from the local utility company to use its poles as part of an eruv that is already under construction, the new law would require all PVC pipes placed on the wooden utility poles to be brown for greater uniformity. “We want things to be aesthetically pleasing and if something is being run up a pole, we want it to match,” noted Queenan. Smaller eruvim that allow residents to carry outside on their own property on Shabbos already dot the lawns of many a Chasidic homeowner in Woodbury. Queenan said that he bumped into one eruv wire as he was walking down a street and had to step onto a private lawn for a moment. “It was only five feet tall and was in the public right of way,” explained Queenan. One Chasidic town resident who asked to remain anonymous out of fear of retribution said that Woodbury should welcome the town-wide eruv which would be virtually invisible and would give residents the ability to remove their private eruvim, which some have found to be an eyesore. The larger Woodbury eruv would be constructed mostly on utility poles and, in areas where power lines run underground, attached to fencing that would run behind private properties. According to the resident, the eruv is being constructed in accordance with town law, but permits to put up fencing needed for the eruv have been stonewalled. They are fighting with us about the shuls and about yomim tovim while we never say a word about Fourth of July fireworks or Halloween,” said the resident. In another incident, a Chasidic worker who was attaching PVC pipes to utility poles for the eruv was allegedly stopped every 10 minutes by someone asking him what he was doing. Members of the Woodbury eruv committee have been working with Rabbi Chaim Steinmetz of the Bergen Rockland Eruv Association who most recently was involved with the contentious construction of eruvim in several northern New Jersey communities, all of which managed to survive legal hurdles. According to the Woodbury resident, the law firm of Weil, Gotshal and Manges, which has successfully litigated several lawsuits regarding eruvim, has already agreed to take on the case on a pro bono basis should a lawsuit arise. Can't wait for the eruv. Now I'll be able to carry a glayzalah tay and eiyer kichel to Woodbury Commons when I take my shabbos walk. I cannot imagine why a eruv is an issue for any non-Jew. How do they even know it is there? the eruv is in public space, that could be an issue. What is his problem with fourth of July fireworks and Halloween? All across America people celebrate the fourth with fireworks and kids celebrate Halloween. They occur one day a year.